The QLT H50 packs an impressive amount of bright light in a compact frame. It combines the robustness and reliability you need with innovative features for additional safety and ease of use. This tower light does more than the standard. You can manage your lighting using its LC 1003 controller that comes with a timer for up to 8 lighting events and start up each light one by one to avoid the risk of failure. You can start the machine without any contact with the engine. 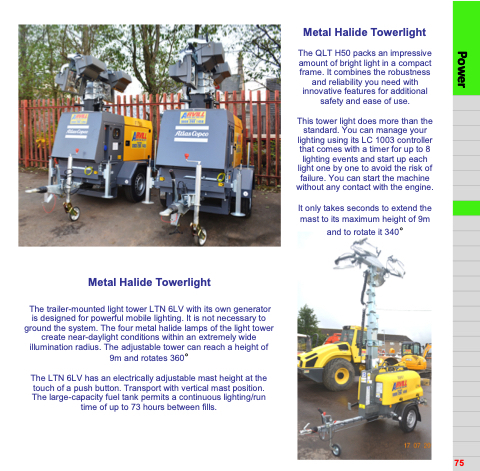 The LTN 6LV has an electrically adjustable mast height at the touch of a push button. Transport with vertical mast position. The large-capacity fuel tank permits a continuous lighting/run time of up to 73 hours between fills.